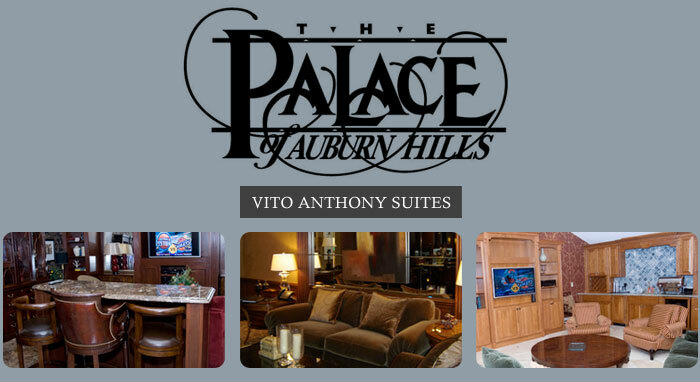 Vito Anthony Homes coordinated the construction of the ultra-luxurious Vito Anthony suites at the Palace of Auburn Hills, located under the stands at the South Loading Dock. This location gives attendees the opportunity to use the same entrance that VIPs, press, and the players use, with a corridor leading to the suites passing the visitor's locker room. Each suite measures between 400-500 square feet and can accommodate up to 15 people. The suites come equipped with a 45-inch LCD television, espresso and cappuccino machine, wine chiller, ice maker, mini-kitchenette and powder room. Each is custom-designed, per the specifications of the owner and a local, high-profile interior decorator. Click Here to learn more and view a video tour of the Vito Anthony Suites.